Whilst I was making an electric foundry, I realised I needed resistance heating coil elements - those spring like things you see in old electric fires. Now these are cheap enough on the internet but I believe you get what you pay for and I wanted to use superior Kanthal wire. 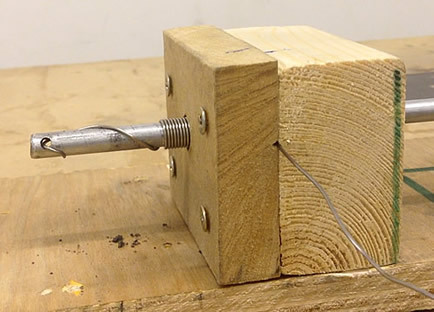 As such I came up with a very simple jig that anyone can make from a couple of scraps of wood. To be honest it's more complicated to explain than it is to show, so this is one of those occasions when I'd strongly recommend watching the accompanying video as this will explain its simple construction and use in just a couple of minutes. How Do Resistance Coils Work? So what is a resistance coil and how does it work? Well the clues are in the name. COIL : A coil is a length of wire wrapped in tight circles. The purpose of the coil is to reduce the apparent length of the wire. The resistance wire involved in a coil may be surprisingly long but by coiling it, it's possible to dramatically shorten the eventual length. For example, I made a coil containing 7 meters (23 feet) of wire, but the coil itself was quite short, maybe 15cm (6 inches) or so. That's quite a space saving and this allows the effects of the wire to be concentrated in a smaller area. RESISTANCE : The length and thickness of the wire determine how much electrical resistance the wire carries. Generally, the thinner or longer the wire is, the higher the resistance. Similarly the shorter and thicker the wire is, the lower the resistance. As electrical resistance occurs within a wire, heat is generated. If the wire is capable of handling heat for prolonged periods and the conditions are just right, it's possible to make the wire glow red hot - and that's what a resistance heating coil element is. POWER : The strength of a heating coil is determined by its resistance, electrical current and voltage. This strength is termed 'power' and this is measured in Watts (or Kilowatts for ever thousand Watts, so 1000W is 1KW). The trick is to work out how long a length of wire is needed to determine these ideal conditions and this comes down to maths. Current Max : This is the maximum current you feel your outlet (and heating coil) can safely handle. In the UK, the average outlet is rated at a maximum of 13 Amps and that's a lot of current. Personally I wouldn't want to take my power consumption right to the limit, so I dial down a little and opt to for a maximum usage of 10 Amps. Resistance Per Meter : The wire you source to make your coil should be dedicated resistance wire intended for use in coil element manufacture. As such it should be rated by the manufacturer and state the resistance the wire offers, usually in Ohms per meter. For example, I purchased some Kanthal wire which had a diameter of 1.02mm (18 AWG) and a resistance of 1.73 Ohms per meter. Inner Diameter of Coil : The last consideration when making a coil is the size of each circle of the coil. This is important information as it helps determine how long the coil needs to be. Obviously bigger coils will use more wire and thus reduce overall coil length - and vice versa of course. To make lifge easier, I've provided a Coil Making Calculator that will do much of the folowing maths for you. But for those interesting in number crunching, let's start with Power. To make lifge easier, I've provided a Coil Making Calculator that will do much of this maths for you. To use it, click here. One last thing - before using the coil it must be stretched. If you fail to stretch it you've basically got a solid length of metal with no resistance. Stretching is easy enough. Simple securely grab each end and pull. You may need to do this a few times. 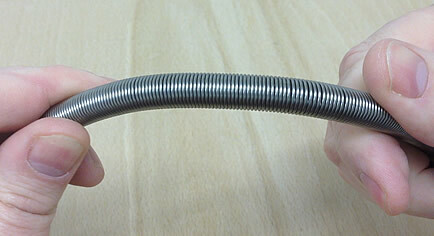 It's generally considered a bad idea to stretch the coil longer than three times its original (unstretched) length.